Tall and elegant, greyhounds are known to be one of the fastest dogs on earth. 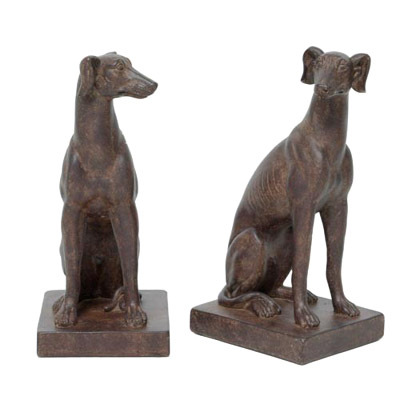 Here, our artisan crafts with attention to detail two greyhounds in the sitting posture. Suitable for use as bookends or for simply displaying on the shelf. Always keep your greyhound on a leash so you will not be taken by surprise. Greyhounds tend to be attracted to other smaller animals like cats and squirrels. If your dog is not on a leash, it can suddenly forget itself and sprint after a small animal. Because they have a strong prey drive, your greyhound will forget sometimes your commands and leave you shocked as you wonder where it had made off to. This also means it can get lost if it ran too far and this is the least trouble you need. So, always place your dog on a leash or set up a solid fence to contain it.